WheelTurnerHawaii.com: HOMESTEAD HILL BOMB Downhill Skateboard Race. THIS WEEKEND. HOMESTEAD HILL BOMB Downhill Skateboard Race. THIS WEEKEND. 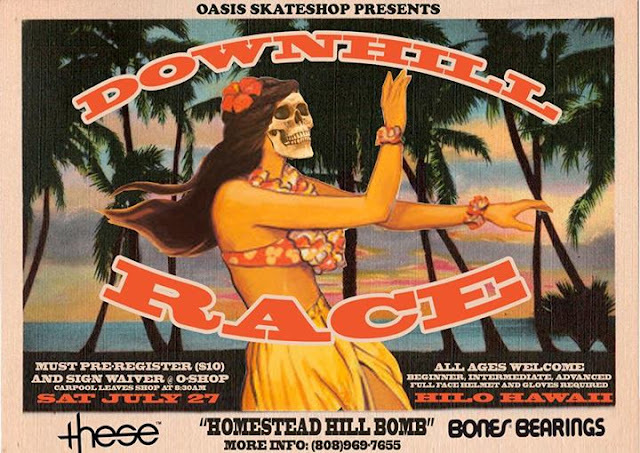 Big Island loke Brian McOuat along with Oasis Skate shop are putting together the " Homestead Hill Bomb Downhill Race" and its guaranteed to be a good time. The race course is PRIME. Its a perfect length, nice n curvey and a pretty decent speed. Not to mention it winds through coffee fields and ends at the ocean! If any racers are traveling from off island for the event, not to worry... there is world class camping at Kolekole beach park which is pretty close to the jam zone. The event's going down THIS SATURDAY, July 27. Get to Oasis Skate Shop bright and early to get registered. The carpool to the race course will be leaving the shop at 830 am. DONT BE LATE. For any extra info you may need, call 808 969 7655. Sadly i don't think i will have the funds to make it out, BUT i will try my best to get you results and event coverage as soon as it happens! Get to Hilo and get ready to race HAWAIIAN STYLE!